Maxim Klimenko, an historian, screenwriter, translator from Greek, and Orthodox publicist, personally knew Elder Gregory, visiting him on Mt. Athos many times over the course of thirty years. 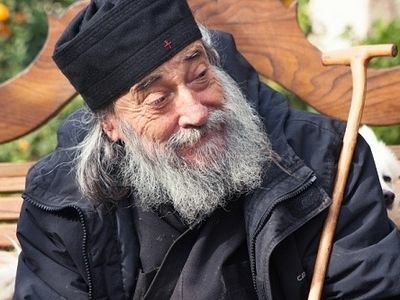 By the great mercy of God, I was fortunate enough to know Elder Gregory from Dochariou Monastery for nearly thirty years. Communication with him left a lasting impression on all: on those who were close to Dochariou Monastery and could rightly consider themselves spiritual children of the newly-reposed Elder Gregory, and on those who met him at least once. I saw this many times. I first saw Elder Gregory in 1989 or 1990 as I was approaching Dochariou Monastery. I was a subdeacon then, and I had a blessing to wear a cassock, and, of course, I had a relatively new and tidy one. Suddenly I saw a man in rather shabby form: His entire riassa consisted of patches (I’m not exaggerating), and on top of it, you could say he was wearing rags and a black apron, also completely tattered. This man of strange appearance was very busy: He was polishing a bronze candle stand with a special tool. “Bless,” I said, addressing the laboring monk (on Mt. Athos, they ask a blessing from all the monks, not just the priests). “God bless you,” he said, not looking up from his work. “I would like, if it’s possible, to see the abbot,” I said. “And why do you need the abbot?” he asked, continuing to work fervently. I explained that I had a letter of recommendation from Moscow to give him, and so on. We all remember the life of St. Sergius, and we remember something similar from the examples of the ancient patericons. But here it wasn’t the same. Everything was somehow very everyday, ordinary, natural. Not staged, not theatrical. That’s how I saw the Elder the first time. Of course, everyone noticed his simplicity and accessibility, but for all of that, he was no simpleton! That’s the thing of it. As we know, he graduated brilliantly from the theological department of Athens University. 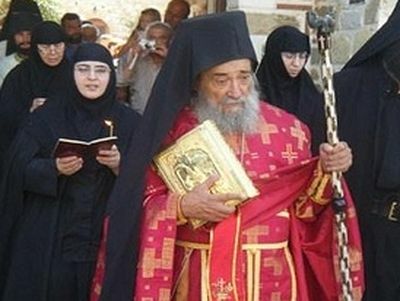 He studied throughout his entire life afterwards, and communicated with and became close friends with people who were the color and pride of Orthodox theology not just in Greece, but in the entire Orthodox world. Highly-learned people with many degrees and regalia would visit him from afar, and they all found interesting conversation with him. He wasn’t some uneducated “peasant in a cassock.” No. I found some cloth suitcase with a zipper from my childhood, with which earlier, in the distant Soviet past, children would go to the Pioneers’ camps. Thank God, the coffer fit there as if it had been made for it. But still, to be honest, I went to the airport not without some trepidation. “The elder blessed, I have to take it,” was all I could repeat to myself to calm myself. And what happened? This whole story quite precisely characterizes the Elder. Fr. Gregory was already very sick in recent times: diabetes, insulin dependence… And not long ago we learned with horror that during reconstruction, the elder suddenly found himself alone and fell into a construction pit. He survived only by some miracle, having received, of course, fractures and bruises. We thought the elder, at such an advanced age, with a whole bouquet of serious diseases, would not survive. But the Lord revealed a miracle and returned the Elder to us for some time. “How?! How could the monastery rise from the ruins and be so transformed in such a short time?! !” even the most restrained gentlemen would exclaim. Besides the monastery itself, the Elder took care for the beautification of the monastery territory, building there some free-standing kathismas and hesychasterions, as they’re called on Mt. Athos—cells where monks can prayerfully retire for some time. When asked: “Why’d you do that? We don’t have so many brothers, and the monastery is huge… Who’d you build all of this for?” the Elder would answer in his characteristic way, with a cunning squint: “You don’t know yet that I will die soon, and Athos will fill up with monks. There will come a time when there won’t be enough monasteries to accept everyone who wants to labor here.” Apparently, something was revealed to him. I would still like to at least hit upon the main thing that I believe is necessary to say. Many remember now the Elder’s sacrificial love, his fiery faith, and so on. I would like to especially emphasize his quality that struck me the most. By his life he embodied the words of the Apostle Paul from his Epistle to the Corinthians: I will destroy the wisdom of the wise, and will bring to nothing the understanding of the prudent. Where is the wise? where is the scribe? where is the disputer of this world? hath not God made foolish the wisdom of this world? (1 Cor. 1:19-20). The Elder was a Fool-for-Christ. Everyone who knew him or at least spoke with him can testify to it. But it was not an ostentatious “foolishness,” as some clergy or monks love to play the part of an elder, of some fool, to add a certain “spiritual” flare to themselves. No, it was foolishness, as they say, speaking impartially. This foolishness is akin to the foolishness of preaching (1 Cor. 1:21) of the ancient saints, who directly denounced those in power, and, regardless of rank, could give them quite a dressing-down. Such nearly patericon-like sessions of shock therapy in Dochariou were practiced constantly by its abbot. They were very sudden turns of spiritual experience for those who just a few minutes ago had been complacently contemplating this kind, smiling, grandfather, wandering, seemingly with embracing arms reaching for them, and even affectionate and courteous with animals along the way… And then, BAM! The cancerous tumor is cut out of your, as you thought, beautiful soul as with a scalpel without anesthesia. I saw this virtuosic operation many times! “Do you have any cigarettes?” he asked him. He immediately obediently pulled an already started pack of cigarettes from his pocket and handed it to the curious Elder. Dochariou pilgrims know how many packs are left right there in the church, at the She Who is Quick to Hear Icon of the Mother of God, by those who have been healed from this addiction. “And here,” I thought, “the Elder has added to his collection,” but I hadn’t even managed to formulate this thought to the end when I suddenly heard the sound of a hearty slap! “That’s it, you won’t have any more cigarettes,” declared the Elder to him whom he so unexpectedly “thanked” for the already-opened pack. “Crazy grandpa,” he said, inwardly smirking, with a carton of elegant cigarettes still in his self-indulgent, luxurious suitcase… Finding himself with them again in private, he took out a cigarette, tried to smoke it, and couldn’t understand what was happening: His head was spinning and he started to feel some bad nausea. He tossed the cigarette and took another—the same thing happened! He persisted, and he threw up! He didn’t even try to smoke anymore, although before that he had been a chain smoker for more than thirty years! Yes, the Elder was harsh, but it was the necessary measure of an experienced doctor who sees all the perniciousness consuming the sick person and understands there is no other way to act. Greater derision, in the context of the whole Athonite tradition and the opposition of Athonites to the imposed European Union norms, cannot be imagined. Thus, by one biting phrase, he gave to understand that it’s not always necessary to implement on Athos what has been adopted in the “progressive,” servile world. It can serve as a temptation, which, in fact, did happen. In the end, Vatopedi itself was not happy with its innovation. The voice of the Elder is a voice of reproof given to our age, by which the chosen prophets used to knock the filth from society as with a whip. Elder Gregory had the gift of clairvoyance. There were things he had mysteriously foretold. I have no doubt about that. All of us who knew the Elder and consider ourselves his admirers mourn his passing in a human way, but at the same time we know that the Lord in Heaven has revealed a new intercessor, a mediator for us all. 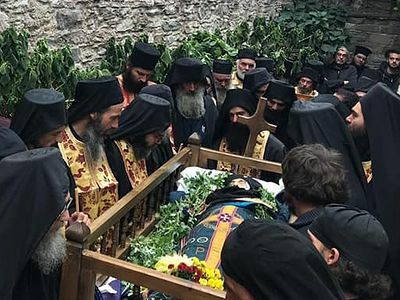 Let us, especially in these days when his soul is still bidding farewell to the world, pray for the newly-reposed Schema-Archimandrite Gregory. Archimandrite Gregory (Zumis) has published an article dedicated to the modern state of Greece and Mt. Athos.